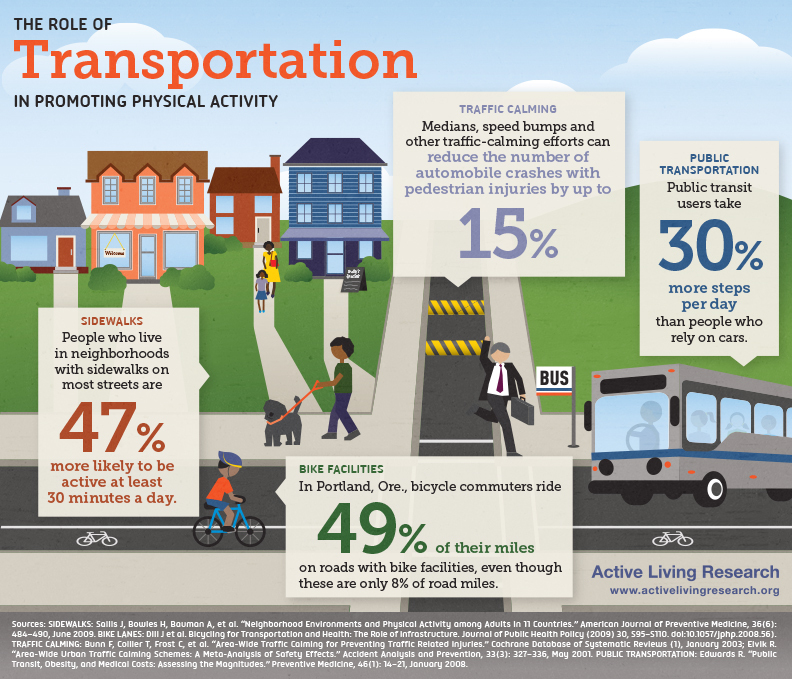 All of these numbers are testament to the importance of street design and transit service in how we make our transportation choices and how healthy we are. The statistic about route selection in Portland particularly illustrates how significant good bike facilities are. The same study that found that 49 percent of bike commuters’ miles were ridden on roads with bike facilities also found that 10 percent of utilitarian bicycle travel — as opposed to bicycling just for exercise — occurred on bicycle boulevards, even though bicycle boulevards make up less than 1 percent of the region’s bicycle network. Cities can keep this in mind if they’re wondering whether anyone will use the new bike infrastructure they’re thinking of investing in. Kudos to U.S. DOT for publicizing these important facts! Though I take issue with the part about the medians. I can’t stand medians in urban areas (obviously, they are good on freeways and other such roads were only cars are present) as they only serve to benefit driving at the expense of pedestrians and cyclists primarily by wasting valuable road space that could be used for buffered bike lanes or wider sidewalks. Plus, the greenery is stuck in a spot where nobody can truly enjoy it. Finally, medians actually encourage speeding by motorists because they feel safer (since there is clearly less risk of a head-on collision) which makes the roads more dangerous for pedestrians and cyclists. I really think talking about medians in the same sentence with livable, healthy, and safe streets is completely contradictory. I’m not familiar with how SF has deployed medians, but there are good ways to do it. NYC has refuge-style median islands at a lot of intersections. They help older people cross wide streets and compel drivers to take turns more carefully. If the median doesn’t extend through the crosswalk, though, then you won’t see these benefits. In SF they often carve into the median to make a left turn vehicle lane. Ben, I understand what you are saying about providing refuge for pedestrians. But the very fact that you need a “refuge” is the problem, and medians are driving the urban design (car-centric) that in turn requires medians in the first place. Medians are always associated with dangerous, car-centric roads. After all, why would a traffic engineer add one? The idea is to prevent head-on collisions. (Note: if they are adding them because it looks nice, then as I have said, that is a complete waste as you could use that space to make the part of the road where pedestrians and cyclists actually travel — the sides — much better rather than wasting it in the center where it can’t be fully enjoyed. And slowing cars down is much more beneficial to pedestrian safety than giving them islands of refuge.) And my point is, though medians are successful at preventing head-on collisions, and though they do indeed give refuge to pedestrians trying to cross, it has an overall net negative affect on the livability of that street (because it effectively makes them more freeway-like which encourages more cars and faster speeds and hence less walking and cycling). And the result of that is you end up with less people even trying to walk on the street in the first place. So yes, for those few who want to deal with the street with a median, they now have a refuge. Yeah for the poor “refugees” of our urban wasteland. But now they are many less people walking on the street (who wants to spend time in a place where they are treated like a “refugee”?). A median in that case is like a band-aid which doesn’t get to the root cause of the problem (too many cars going too fast). If we want to be designing livable streets, then we need to get to the root cause and stop with the band-aids. I haven’t seen any median treatments that make streets more highway-like. Like I said, the main purpose of the ones in NYC is to compel drivers to take turns more slowly and give slow walkers more leeway when they cross, not to prevent head-on collisions. It’s the same concept at work with the concrete islands in the NYC protected bike lanes, except these islands are in the middle of the street. I’m not saying it’s the right approach for every problem, and I’m sure it can be botched, but median pedestrian islands are a common safety treatment in countries that have made a lot of headway in reducing pedestrian injury rates, like Germany and the Netherlands. There’s nothing intrinsically bad about them. Here’s a before-and-after shot of one in my neighborhood in Brooklyn on Vanderbilt Avenue, which sees a lot more foot traffic and bike traffic now than before the median islands went in. It seems you’re talking about medians at intersections only, correct? If so, I think that is okay. My concern is medians down the whole length of the road. Physical activity is important, and I support it. Safer streets for walking are also important. However, fitness is something that should be achieved on its own. People get fat (or stay fit) as a result of the proper balance between calories intake and calories spent. If people get fat because they eat too much, that is a dietary problem, not a transportation problem. To say otherwise is like blame the fact people no longer need to haul water on a bucket from the fountain (but just open the tap), or work automation, or use of laundromats instead of grueling manual washing for obesity.